An 8 part Danish thriller – yup, of course it’s on BBC Four. I enjoyed this series immensely. At just 8, 45 minute episodes (broadcast in pairs each week) it didn’t outstay its welcome at all, powering through without too much unnecessary padding or red herrings. There were occasions that it felt like they’d maybe had a slightly longer series in mind, going into more back-story on the characters with more use of flashbacks, focussing each episode on a small number of characters. The end result actually has only a very small number of flashbacks which while they did what was needed, did feel a little odd at times, like we were only seeing the tip of an iceberg. Just as the flashbacks are very focused, the same is true of the overall storyline. I found myself slightly missing the wrong turns and dead ends that most thrillers have. Everything here progressed fairly steadily and smoothly towards the conclusion. It’s boiled down to the bare bones and only ever has what is necessary, which is satisfying and impressively intense, but occasionally a little too easy. The ending does however manage the impressive trick of being both predictable and surprising and kept me rethinking things. Even within that time they find room for some character development for quite a wide range of characters, both above and below ground. Johannes Lassen as Philip the head of the investigation team is impressive, delivering a flawed and conflicted character, but one that’s also in control and professional. He’s a good centre for a show like this. I could have lived without the romantic element with the negotiator, but it wasn’t pushed too much and did enrich her role a bit, so I’ll allow it. The hostages are a diverse and interesting group even with the limited screen time each one gets. I don’t think this got much in the way of press, and it’s not got a ‘hook’ like The Bridge, or The Killing, but it actually makes both of them look flabby and a bit clunky. So I hope this turns into a regular series. I seem to have a rule that I have to watch any drama that comes along with subtitles. It’s a mixture of pure pretentiousness on my part combined with at least a small amount of logic that if it’s a show that’s good enough to get picked up outside it’s country of origin, it can’t be that bad. Modus is one of the exceptions. It really was quite mediocre. I don’t really know where to start on explaining its mediocrity, it was pretty much consistent throughout. The plots were contrived, the characters stereotyped and the scandi-ness overdone. A few times I wondered if it was actually attempting to be a parody. Everything just felt like they’d pulled dozens of ideas off a shelf and clumsily bodged them together. Too many ideas, too little imagination. The lead actress managed to bring some life to her character, but everyone around her either couldn’t, or wouldn’t do anything with their characters at all. Not that I necessarily blame them when the script gives them nothing but dumb cliches to work with. It took me a few episodes to realise that it wasn’t very good, and by the time I did, thanks to the fact that the episodes were broadcast in pairs and it was only 8 episodes long, I figured I may as well just keep going to the end. Even at just 8 episodes it was horribly drawn out, adding boring and repetitive loops to stretch a couple more episodes. Then to add insult to injury, by the time the crimes were untangled and the criminals unveiled I was muttering and even shouting “oh come on!” at the television screen for its dubious presentation of… well… just about everyone actually, but particularly gay people. It wasn’t really good enough to feel outraged about it, but it was quite frustrating. This series seems to continually surprise me, turning out to be about things that I wasn’t expecting. Back at the start of season 1 I expected it to be a cultural/political piece looking at the difference between Denmark and Sweden, neighbouring countries separated by a narrow stretch of water and joined by the titular bridge. In fact it turned out to be about a misfit police pairing investigating a serial murder. Well, no, I guess it turned out to be about a personal vendetta and I thought it would probably be the end of the series. Then season 2 turned up and somehow managed to coherently develop on that before seeming to close the door on a third season by getting rid of half of the lead pair. So I don’t know what’s more surprising, that it came back for a third season at all, or that it came back even better than it was before. What is completely consistent is the addictiveness of the show. Once again I let a few episodes store up on the Sky box before my brother nagged me to watch them so that we could talk about them. As soon as I started watching, I couldn’t stop, powering through the backlog and then counting the hours until new episodes on Saturday evening. On one occasion I was actually compulsively refreshing iPlayer waiting for it to appear as soon as the live broadcast had finished. There is of course an element of manipulation with the use of cliff-hangers, but the writers also do an excellent job with the overall pacing of the series, keeping the crimes, investigation and personal storylines moving along, constantly taking small steps forward. Even the red herrings and miss-directs manage to not feel too frustrating, none of them felt like dead ends just there to increase the episode count. Danish-Henrik makes an interesting alternative to Danish-Martin, and also a fascinating partner and counter-point to Saga. The two of them have a mountain of baggage between them, but somehow they work together. Sofia Helin as Saga excels this season, the character’s behaviours and responses all seem to finally hang together. She’s consistent in her strengths and her weaknesses and being pushed outside of her comfort zone really clarifies things for her, the characters around her and the audience. Henrik’s own personality and coping mechanisms also make sense as his own background is revealed and the development of their relationship is fascinating and rewarding to watch. While I still think there is a missed opportunity to look more closely at the similarities and differences between Denmark and Sweden, I didn’t find that so frustrating when watching. I never really knew what country they were in or what language they were speaking, but it really didn’t matter and of course that wouldn’t bother the Swedes and Danes at all, who of course are the primary audience, not the internationals. I’m also not 100% certain that I fully followed all the twists and turns of the plot or the overall conclusion. But it just didn’t matter. It was a completely compelling from start to finish and my only regret is that it’s now gone. I have no idea what direction the story would have to swerve to next, but please, please, please let there be a season 4! I’ve been staring at a blank page trying to start this review and struggling to find a line on it. Trapped is just really, really good. It pulls all the engaging elements of murder mysteries together into one very well structured story: a small community with it’s own politics and history provide a handful of other mysteries for the audience and characters to understand and uncover, sometimes tying things together, other times making things just more complicated. I never felt like I was being misled or that any of the dead-ends were just extending the story out to the episode count, there were little reveals and well timed action sequences to keep things moving along and it all hung together very nicely. The array of characters are all interesting to spend time with. I particularly liked that each of the characters has a different place and longevity in the community. Some are well established and known, others are only visitors who are involved just because of the murders. It’s interesting that the lead character Andri is actually in the middle. As chief of police he’s a prominent part of the community, but being a relatively recent arrival he doesn’t have the history that many other characters do, but his family connections also add an emotional connection. The really unique element to Trapped was the location itself, the story itself could have been an Agatha Christie novel quite frankly if not for the fascinating setting. To the characters of course it’s nothing special, but to the audience the trials of living in the remote Icelandic town add to the drama. The weather is a pretty major player in the series. It sets the tone, closing the community off and bringing an almost overwhelming tension at times. I’m not sure whether this is a standalone mini-series, or whether it will return for a second series. As with any successful series like this there’s the mixed feelings towards a second series. Part of the power of the series is that this kind of event is almost unheard of for the community, so a second event is both improbable and less impactful. But I can’t say I’d be disappointed at the idea of seeing more of this utterly compelling series. I’m getting increasingly behind on my reviewing, so am opting for a round up post to gather my thoughts on some of the new series that have appeared in the last few weeks on British TV. Mostly procedural (except one), mostly British (except one). Babylon arrived with a fair bit of publicity pushing its connections to Olympic Opening Ceremony hero Danny Boyle (producer and director). It’s described as a comedy-drama, but I actually don’t know much more about it. Initially that was because I wanted to come to the series reasonably fresh and from what little I did read everyone was having a hard time describing what the tone and flavour really was. The principle reason for my ignorance is that I didn’t make it more than 10 minutes into the first episode before I had to switch it off. The first scene made me cringe, the second left me angry and halfway through the third I realised that I was actively searching for ways to distract myself from having to watch or listen and so decided to give up. I don’t know whether it’s intended as biting satire based on what police work is really like, but nothing I saw gave me any confidence that it was based on reality, and even if it was, then that’s not something I want to watch. I’m sorry, but if the armed police really are that horrific and juvenile than I don’t want to see it outside of a documentary or news story. The introductory pilot will be followed by a series later this year, I won’t be touching it with a barge pole. Sky are increasingly moving into content production rather than just purchasing other people’s shows and The Smoke is one of their flagship offerings. Set in a fire station in Mile End it picks up 9 months after a disastrous call-out that had serious physical and mental fallout for the fire station’s chief, played by Jamie Bamber (Battlestar Galactica). I’ve always been a bit surprised that given the plethora of cop procedurals there aren’t more series about Fireman (or paramedics for that matter), but I guess fundamentally someone lying in the street with some fake blood is considerably cheaper to do than raging infernos. The Smoke certainly doesn’t compromise on the budgets or spectacle mixing some genuinely scary fires to accompany with more small scale chip pan fires and traffic accidents, although the latter is possibly even more scary due to its relatively common day feeling. There’s also no skimping on the melodrama, it’s as much a series about emotions and characters as it is about smoke (the title I’m sure is all metaphorical as well as literal) and it certainly doesn’t pull its punches on the horrors the fireman see or the not always sensible ways they deal with them. In contrast to Babylon, somehow the juvenile antics of the firemen don’t push them away from the audience, instead making them easier to connect with although not necessarily making them likeable. It’s all laid on a bit thick in places (particularly Bamber’s accent) but it’s certainly interesting enough to have me hitting the series link. This series is now four episodes in, but you can catch up on iplayer until April. I was initially a bit underwhelmed by the series, but for some reason I stuck with it and it’s rather grown on me. I was expecting this to slot into the Merlin shaped hole on Saturday nights, pitched more towards the younger audience with humour, silliness, relationships, unsubtle moral quandaries and a heavy dose of action. What I got though was an attempt to step towards a more mature audience on a Sunday night, but not a massively successful one. The tone is quite uneven, there’s plenty of entertainment and plenty of interest, but the two aren’t blended together, instead coming in blocks of “here’s the funny bit” and “here’s the serious bit”. Each bit is good, and it has smoothed out a little bit, but it can make it rather frustrating to watch and easy to tune out the bit that you’re not in the mood for at the time. There’s plenty of energy though and I like what they’re doing with the characters and the variations to the traditional story that makes it more suited for a longer series, so we shall see how it goes. As we wave goodbye to the Scandinavian Bridge, BBC4 immediately offers us the Belgian Salamander to deceive us into feeling cultured by watching something with subtitles, while really we’re just watching a slightly trashy thriller. Four episodes have aired by the time I write this, but I’ve only watched the first of them and am allowing the others to build up on the Sky+ box as I haven’t quite decided whether I’m going to stick with the show. The first episode was intriguing enough – a colourful police officer, a three dimensional villain, an original crime, some action, some politics, some mystery and some humour. I just found myself having a bit of an internal crisis; if this had been in English would I have bothered with it, or am I just watching because it’s got subtitles? It’s a silly thing to get caught up on, but I have a suspicion that the series itself is intrinsically quite disposable and for now it’s not quite bubbled above the other things on my to-watch list. Given my anaemic response to many of the recent new British drama offerings, I didn’t go into Channel 5’s Suspects with anything resembling expectation or hope. I mean, Channel 5 doesn’t really have the reputation for showing high quality drama, let alone making it themselves, so I was absolutely astonished when I found the first episode original, interesting and utterly compelling. The documentary filming style immerses the audience in the action and the complete focus on the crime and investigation is refreshing. The characters are completely secondary, but thanks to the talented actors they manage to reveal themselves organically. The investigations feel realistic and the stories are interesting, although in both episodes I’ve watched the eventual outcomes were fairly predictable and standard which did let things down a bit, but overall I’m really impressed. 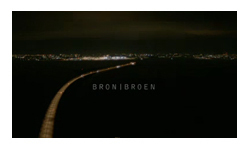 I almost didn’t watch this series of The Bridge. I found the first season incredibly compelling all the time I was watching it (so long as I didn’t think too hard about the details) but was then disappointed by the ending. I always get frustrated when any sort of procedural (medical, legal, police) makes the investigators a part of the investigation. I feel it’s overused, wheeled out too often to boost the ratings and consequently breaking the realism the series offers. I forgave The Bridge though, because I thought it was actually a one series show, so rather than jumping the shark it was just what the entire series was about. So I was a little surprised when the series returned for a second season and a little reluctant to watch for fear that it would follow the same pattern, thereby making its detectives the unluckiest in Scandinavia (ok, maybe slightly behind what’s-her-face from The Killing). What I liked was that the series neither forgot what had gone before, nor got completely overwhelmed by it. There was plenty of fall out from the previous incidents, but also a self contained mystery that steered clear of personal entanglements. The crime(s) were just as intriguing to watch, twisting and turning along and I think they actually held together better than last year. The characters of Saga and Martin just a compelling to spend time with. For a ten part series there was a lot of stuff going on, and despite the subtitles restricting my ability to multi-task, I was never bored. I do have to say that there were a number of elements I was less keen on. There were a few of the personal elements of the story that I found unlikely and irritating. Saga’s boyfriend was good comedy material, but utterly incoherent (had he actually spent any time with her before moving in? Why was her behaviour in the slightest bit surprising?). Martin’s psychiatrist, friends and family similarly had seemingly no clue what they were doing leaving him to bumble along on a doomed trajectory. I also continue to wish that the writers would make more of the Danish/Sweden elements, I rarely knew which country I was in and it made even less difference to the plot than last season. Sadly I felt the season was utterly let down by the final episode. It felt like the writers had written a coherent and well thought out story and then realised they had miscounted the scripts and needed an extra one. The additional twist was bolted on the end with very little thought for smooth character or plot development. As for Martin and Saga’s actions, I still can’t quite decide whether they were perfectly in character or a complete departure from reality, or possibly both. Regardless of whether they were right or wrong, I still didn’t like it though and was left with a sense of dissatisfaction that conflicted with my overall enjoyment of the series. I’m somewhat startled to find that there will be a season three of The Bridge. I was all set to say that I thought limiting themselves to two seasons was a brave and powerful choice, giving a well rounded and complete story without a happy ending and without drawing things out. The fact that there will be a third season makes me slightly nervous, but I suspect whatever my feelings, I’ll end up as hooked as I have this year.